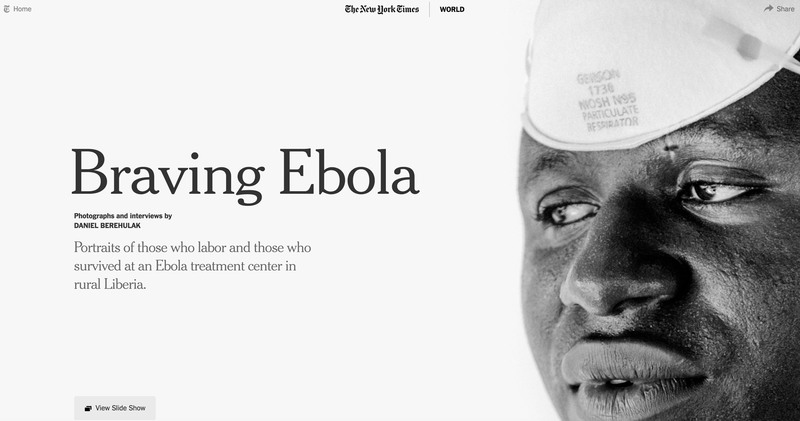 Simple, yet very powerful web publication depicting Ebola workers in Liberia, by New York Times. ‘Braving Ebola’ consists of photographs and interviews by photojournalist Daniel Berehulak. Powerful black and white portraits of medical staff at an Ebola treatment center in rural Liberia. The subtle fade-in effect combined with a clean, white design creates a stark contrast with the harsh working conditions these people operate in. ‘Otsuchi future memories’, a intriguing photography project by Alejandro Chaskielberg, mixing family photos from the Fukushima tsunami with newly made photos of the locations of the family homes.